DESCRIPTION You are looking at the SWG mk6 Polo vent pod insert which is designed by us to fit ALL 9n2 & 9n3 Polo's inc Gti models. including left-hand drive models. 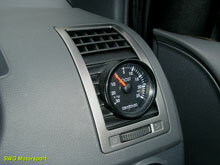 The pod allows any 52mm gauge or dial to be integrated into the driverside air vent, this is ideal for keeping thar O.E look to the interior but still allowing any 52mm gauge of your choice No Gauge included to be seamlessly incorporated into the Polo's dash while still keeping some airflow to the driver's window (ideal for mount a boost gauge for your 1.8T Gti etc). The item shown is just the insert only which has been specifically designed to replace the lower vent slats in the original vent with an easy to fit tailor made gauge holder pod. PLEASE NOTE : The original vent will need to be dissasembled to allow the fitment of this item. 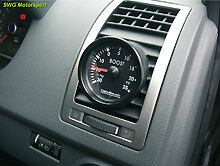 A matching Boost gauge is also available aswell as various other kit options. (please see other Polo items). 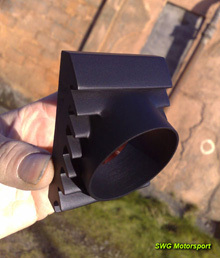 Once again this is an insert only and requires fitting into your original vent housing.